Steve, this year the State Assembly sent a strong message to the voters of California and I am livid! In a stunning, hurried, and unreported push, Assemblyman Marc Berman authored a bill late last year that essentially takes aim at the intellect of every voter in CA. “Nobody reads it, and nobody understands it”. This is the rationale behind the decision to eliminate from the Voter Guide, the legal text of all propositions, according to the CA SOS office. AB 606 passed along party lines and changed the election code to eliminate from the voter’s guide, the actual text of a proposed law. Did you notice it was looking a bit thin this election cycle? Instead, all we see in the voter guide is, “the legislative analysis” (an opinion of the legislature), rebuttals for and against a proposed proposition (also opinion), and who supports and who does not support a CA Proposition. Make no mistake about it; this is a victory for dictators everywhere and a sure sign of the despotic government that is to come if the Legislature is to have their way with us. What are you voting for in November? Who knows! The message is that we must trust the politicians (the intellectual elite) to tell us how we should vote. Forget the actual details of the law… But for those of us who have been around for a while, we know the devil is in the details! You may, of course, call the SOS and have the actual legal text of the propositions sent to you via snail mail. Be prepared to stay on hold for more than 30 minutes. This is no way to run a Constitutional Republic! Can you help me to make sense of this legislation? I know that there are only a few states in the nation that allow the ballot initiative process. Do other states eliminate the text of the law in voting? Of course they will. In a State ruled by the Tax and Spend Politicians that the voters put in office time and time again nothing will change until the ones actually footing the bill leave the State. Less than half of Californians actually really pay taxes and the rest are “takers” who always are looking for more “free lunch”. “YES” on 5 and 6. “NO” on everything else! The idea of more taxes in a state that is bankrupt, if the truth be told, is just more Brown-Newsome insanity. God help us if this continues. We will be the new Venezuela! Thank you Katie for being on Phil Cowan’s show -Always a pleasure to hear down to earth CONSERVATIVE talk! Never underestimate the willingness of CA voters to increase their own tax burden (or to give politicians more money to play with as they see fit), even when most of that money is not required to spent as they claim they will. We can’t leave this state soon enough. Send the bill to Mark Zuckerberg, and Tom Steyer. Of course they will vote these huge tax increases in for several good reasons, some want free stuff, they do live in a la la land, have no concept about where this money will eventually go to and money grows on trees. Funny , or , not so funny how people repeatedly claim that ” the voters in California ” brought this kind to law into effect and vote for more taxes . There is no doubt that the vote here is rigged. There is no doubt that Mexican Nationals are voting in California’s electoral and lawmaking process , non citizens of the US. There is no doubt that those who cry ” leave California “, are a part of the problem and not an answer to ANYTHING . Even the dead vote in California but Californians get the blame for what a Demoncrapic bunch of freedom hating ” elite ” are doing to us. Discounting government employees that will vote in more taxes since it is what pays their salaries and THEY WILL GET COST OF LIVING RAISES TO COVER THE HIGHER TAXES , how is it that it is that California voters in general are stupid liberals that are the ones responsible for something that MOST of us never voted for.? We have all been trained to be unafraid of government deficits. Politicians keep overspending and underperforming and we keep reelecting them. I am happy to be 80 and soon departing and also guilty. We let it happen. Hi, I just wanted to note a quick correction on this article. 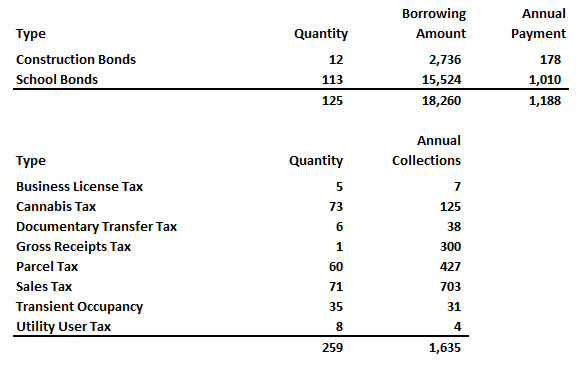 > California’s voters approved another nearly $700 billion in new taxes and payments on bonds. I know the taxes are bad, but they are not THAT bad (yet). I think you meant to say million, not billion, right?